If you’re currently strapping yourself into the rollercoaster that clacks towards peak demand with an impending sense of ominous dread, please know that there is still time to implement some quick fixes in your operation that can help minimise the stress. If you need a quick solution to reduce picking times and improve the efficiency of your warehouse space then corrugate pick bins could be the answer. They can reduce this logistical headache without significant capital investment. 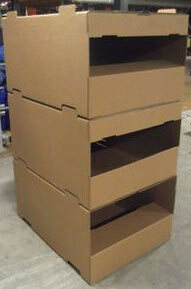 Corrugate pick bins are made to order, with many bespoke options to ensure the design works for your warehouse. You can choose the type of bin access you need, including fully and partially open faces, straight or chute fronts. The design can include a supported inner tray to subdivide the bin, increasing the number of pick locations and providing convenient locations for related goods. 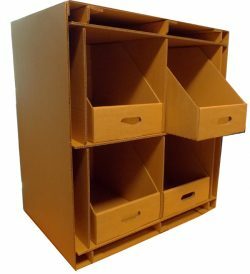 Floor-mounted pick bins can be supplied with integral feet for pallet and fork lift handling equipment, along with shelf separators – especially useful when similar products are stored in adjacent locations. Hi Pagan, thank you very much for your enquiry. We are based in the U.K. and unfortunately don’t ship packaging to New Zealand at present. Sorry, we cannot help you more on this occasion. This is a good article to read about improving warehouse efficiency, this could be a good strategy to be used.